5 Simple Ways You Can Make The Most of Your SEO! SEO is the Bread and Butter of Digital Marketing. Actually, I think I’m selling it a bit short. 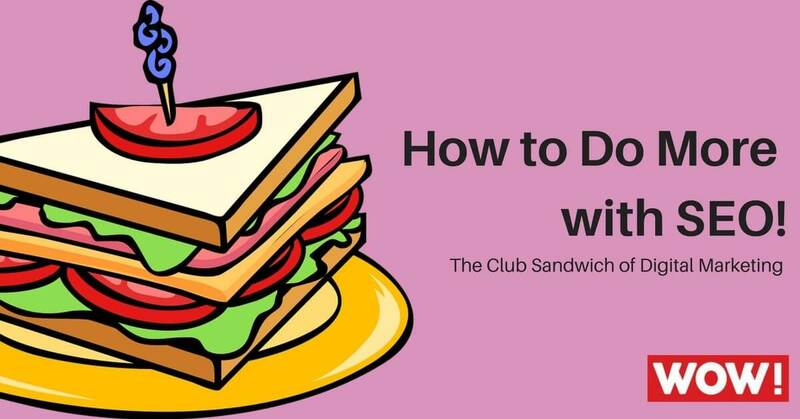 SEO is the Club Sandwich of Digital Marketing. It’s got your standard Bread and Butter, but it’s also got so much more! You’ve got all that additional goodness sandwiched between 3 slices of delicious Bread. You need to truly understand the amazingness that is SEO to fully get the most out of it, and I’m about to give you 5 tips on how to get more out of your SEO optimisation. Do you want to improve your SEO ranking? You need to know what you really want in order to get more from your SEO Marketing. Are you looking for more traffic, brand visibility, ad impressions, and sales, all of the above? Getting specific is the only way to improve! Remember the days when the SEO side of things was just in their own little bubble? Now it’s time to burst it. If you want your SEO to thrive, it needs to mingle with every internal company resource you have, whether that’s copywriting/editing, design, web development, PR etc. You have to think that all your marketing efforts and your website developments are going to impact your Google ranking, so not only do your SEO team need to know about it, they need to be involved. Do you want to be THE brand? You don’t need millions to make it happen, just good SEO marketing. You need a well-designed website that works on both desktop and mobile, an active Social Media account with an engaged audience and posting great shareable content. Combine that with mentions from industry websites and blogs, and voila! You’ve got some free help for your SEO optimisation and Google ranking. You need to become worth talking about and worth sharing and searching for! It’s 2017, there are multiple versions of everything. That’s great for customers but bad for us. The attention span of customers is shrinking, and they are spending less time looking around. You need something that says “Pick Me” instead of “Me Too”. If you don’t do something different with your layout or content, Google will penalise you and you’ll lose your Google ranking. We’re not saying that you need to focus all your budget on SEO, but SEO optimisation is an investment that is worth more than just a little amount of time and money. Long-term, SEO is still the best online marketing investment you can buy! It needs to be of high quality though if you start with it low it won’t last. It’s like building your home on shaky foundation, it’s going to break eventually and come crashing down. When I say don’t be cheap, you need to make sure you hire high-quality writers, designers and web developers to create link worthy content.